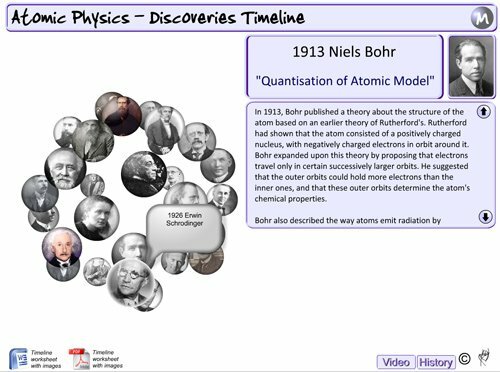 1) Historic rotating time line of the Scientists which did a lot of discoveries in the field of Atomic Physics. You can download images to make a worksheet or your own poster. Also you can copy text from animation. I will be upgrading this soon to have animations / images in the space below the information text which change when you click. 2) A series of video clips in FLV format with menu from Dr Brian Cox about particle physics. I will be upgrading this soon so video player will resize to fill larger area on click. At the moment it is online only so the fullscreen button does not work. However, I will make an MSI when I have finished it so you can download to your local PC. Any suggestions welcome…. First impressions are very good. However, I clicked first on Perrin – “whet” instead on “went” then on Curie “redefined” instead of “refined”. Let me know when you’ve checked the rest please. Thanks good comments I will review ASAP, the data is loaded externally from text file so the odd error has crept in. I found it very hard in this part as there are 30 sets of comments to do. If anyone wants anything added I can just paste it in so if you want just post the comment below (copy and paste from animation and I can drop in). I have sorted these ones out! Also any other ideas please let me know, I will add some animations and images as well too to help pupils understand the text. Thanks guys that feedback is really appreciated. I am planning to add much more to this tool as previously said. The first will be the animations or image when you click on the person. However, the will take a bit longer to sort out. In terms of the blog is is very simple really and I used the Arjuna template which seems to work pretty well and updates ok.
Also I will keep all the animations free as long as the ads on the site will pay for the hosting so if every visitor clicks my site will stay and I will keep going! Hi there! I simply wish to give an enormous thumbs up for the great info you have got right here on this post. I will likely be coming back to your blog for extra soon. Thanks much appreciated, I will try and add some more soon but as I teach fulltime it is hard to find the time. Could you possibly tell me how I can edit the swish examples such as imagesphere and wordsphere? I have tried every click I know. I own Swish Max 4. Thanks. Hi i will need to use the random ball as you click on the ball it will redirect you in an URL that i want , is that possible? if you like you can email me to my email address thanks in advance this web site is very good!! No not sure you can as it is hard coded in. Maybe use Swishmax template as this is all it is.